Once I left my long-time employer, who insisted we use PCs with all their issues, I quickly converted to Apple products, including iPods, iPads, etc. The one thing that I felt was a little “tweaky” was their original flat 30-pin I/O and power connector. The problem we users all had was that it wasn’t very easy to figure out the correct way to plug it in – especially in a dark room. The icon on the plug was not very distinct and you basically have a 50-50 chance of getting it wrong on the first try. I got the idea to add a stick-on object to identify the correct side, such as those collections of stickers found in scrapbooking stores. Try to find a set of small stickers that have some dimensionally in the “z”-direction, so that you can feel it in the dark. I used a small “period” sticker that has worked great (see photo). This has worked out quite well for me. 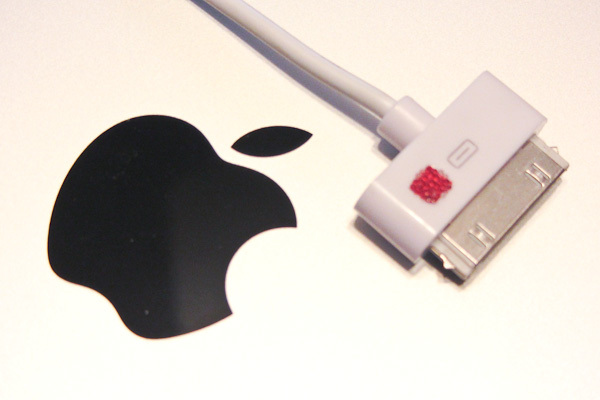 Apple’s older 30-pin connector with polarizing “dot” attached. I have to applaud Apple for finally devising a non-polarized power and I/O plug (the Lightning connector) on the one hand, but on the other, for millions of users, the conversion will be problematic for a (long) while. 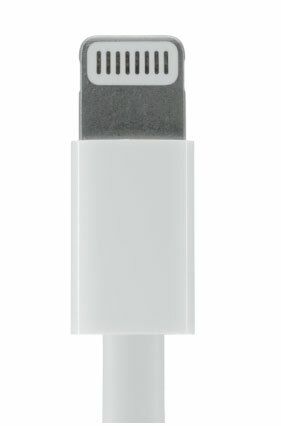 Apple’s new “Lightning” connector with reversible (non-polarized) dynamically-assigned pins. Editor of The Connecting Edge, Martin Rowe, has pointed out an issue with hardware add-ons, such as Oscium’s Wi-Fi spectrum analyzer, which uses the 30-pin connector. Apple’s 30-pin to Lightning adapter works for this receiver, but now the hardware will kind of “dangle” there on the iPad. Not very handy. Perhaps instrument or accessory manufacturers could use Bluetooth (or similar wireless) connectivity for future products and avoid the hardware connectivity issue altogether. Anyway, change is hard, but I guess we’ll live through it! This entry was posted in General and tagged Apple, connector, Lightning. Bookmark the permalink.